After showcasing its new Cygnus Ray-ZR scooter at the 2016 Delhi Auto Expo earlier in February, Yamaha has now put the scooter on sale in India. 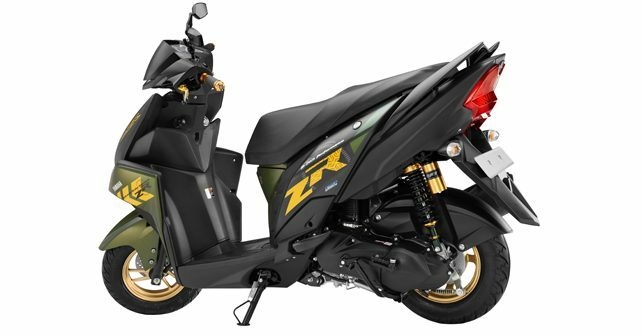 Billed as a “next-generation real boy’s scooter” – which sounds a bit far-fetched – the Cygnus Ray-ZR is offered in both drum and disc variants, with ex-showroom Delhi prices set at Rs 52,000 and Rs 54,500, respectively. Yamaha is marketing the Cygnus Ray-ZR as a macho scooter that is designed to reflect the strength of a “well-trained physique”. As a result, the scooter sports a deeply-sculpted and powerful front mask along with slightly muscular body panels in comparison to other Ray models in the range. Powering the Cygnus Ray-ZR is the same air-cooled 4-stroke, 2-valve 113cc engine that’s mated to a continuously variable transmission (CVT) unit. Tipping the scale at 103 kg, it’s claimed to be easily maneuverable and agile to ride. The scooter has a claimed fuel economy 66 km/l. Among other highlights, it has an under-seat storage space of 21 litres, newly designed instrument cluster, tubeless tyres, etc. It will be offered in two different exterior shades for both disc and drum models. Apart from the new Ray-ZR, Yamaha’s current scooter line-up includes Cyngnus Ray – primarily aimed at girls, Cygnus Ray Z, which is targeted at young people, the more practical Cygnus Alpha, and the snazzy looking Fascino.